Iraq has been in civil war for many years. The lives of war-suffering people are impoverished. Approximately 11 million people are in need of humanitarian assistance, and 3 million of them are internally displaced persons, living in displaced persons camp. The situation is the same in Hawija, Kirkuk, which was occupied by the IS rebels for three years from 2014. The residents of the region, which the government recaptured in October 2017, have flown into nearby displaced persons camps in Anbar and Ninawa, but the basic services for survival are in desperate need. As the number of people flowing into the displaced persons camps increased, the number of patients increased, and the medicine and medical supplies were given out. Therefore, a large number of internally displaced people are suffering from various diseases such as itch and chronic disease. The Intl. 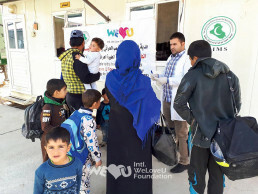 WeLoveU Foundation, which learned about the local situation through the Embassy of Iraq in Korea, donated USD 20,000 worth of medicine and medical supplies to the Iraqi non-governmental organization—United Iraqi Medical Society for Relief and Development [UIMS], from September to November 2017. About 90 medical supplies, including anthelmintic, treatment for itching, antibiotic, antipyretic drug, antiseptic, medicine for high blood pressure, disposable syringe, bandage, etc., were supplied to three mobile medical clinics and one primary health care clinic in Anbar and Ninawa. The Iraqi government recaptured the northern areas once occupied by the rebels and declared the end of the war in December 2017. However, even in 2018, the remaining rebels are still engaged in combat with government forces in various places, threatening the survival of the residents. It is time for the international community to pay more attention to the Iraq civil war victims.